Duke University electrical engineers have developed a wirelessly powered telemetry system that is light and powerful enough to allow scientists to study the intricate neurological activity of dragonflies as they capture prey on the wing. Past studies of insect behavior have been limited by the fact that today's remote data collection, or telemetry, systems are too heavy to allow the insects to act naturally, as they would in the wild. The new system uses no batteries, but rather beams power wirelessly to the flying dragonfly. Duke electrical engineer Matt Reynolds, working with Reid Harrison at Intan Technologies, developed the chip for scientists at the Howard Hughes Medical Institute (HHMI), who are trying to better understand the complex flight control system of dragonflies. They gather their information by attaching tiny electrodes to individual nerve cells in the dragonfly’s nerve cord and recording the electrical activity of the dragonfly's neurons and muscles. Existing systems for recording neural activity require large batteries that are far too heavy to be carried by a dragonfly, so experiments to date have been carried out with immobilized dragonflies. If the new system proves successful, the researchers expect that broad new avenues into studying behavior of small animals remotely will become available for the first time. “We developed a wireless power system that avoids the need altogether for the size and weight of a battery,” said Reynolds, assistant professor of electrical and computer engineering at Duke’s Pratt School of Engineering. He presented the results of his work today at the annual Biomedical Circuits and Systems Conference, held by the Institute of Electrical and Electronics Engineers (IEEE) in San Diego. “The system provides enough power to the chip attached to a flying dragonfly that it can transmit in real time the electrical signals from many dragonfly neurons,” Reynolds said. The chip receives power wirelessly from a transmitter within the flight arena in which the experiments are carried out. The system can send enough power to the chip to enable it to send back reams of data at over five megabits per second, which is comparable to a typical home internet connection. This is important, the scientists said, because they plan to sync the neuronal data gathered from the chip with high-speed video taken while the insect is in flight and preying on fruit flies. The average weight of the dragonfly species involved in these studies is about 400 milligrams, and Leonardo estimates that an individual dragonfly can carry about one-third of its weight without negatively impacting its ability to fly and hunt. Currently, most multi-channel wireless telemetry systems weigh between 75 and 150 times more than a dragonfly, not counting the weight of the battery, which rules them out for most insect studies, he said. A battery-powered version of the insect telemetry system, previously developed by Harrison and Leonardo, weighs 130 milligrams -- liftable by a foraging dragonfly but with difficulty. The weight of the chip that Reynolds and his team developed is just 38 milligrams, or less than half of a typical postage stamp. It is also one-fifth the weight and has 15 times greater bandwidth of the previous generation system, Reynolds said. 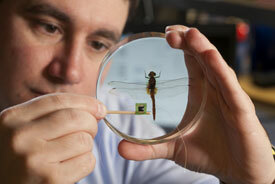 The researchers expect to begin flight experiments with dragonflies over the next few months. The testing will take place in a specially designed flight arena at HHMI's Janelia Farm complex equipped with nature scenes on the walls, a pond and plenty of fruit flies for the dragonflies to eat. The chip, with two hair-thin antennae projecting from the back, will be attached to the belly of the insect so as not to interfere with the wings. Since the chip must have uninterrupted radio contact with the power transmitter on the ground, the chip is carried much like the backup parachute on the underside of the animal. The project is supported in part by HHMI. Duke graduate student Stewart Thomas was also a member of the team.